The second phase of Naas Racecourse’s €3.2 million redevelopment has started. This will see a total revamp of the grandstand to include a ground floor café, a dedicated members area on the first floor and a sponsors lounge on the second floor. There will also be a complete interior upgrade on each floor of the stand. Hamilton Young Architects and Jennings Design Studio worked on the design of the grandstand and Parson, a Kildare-based company specialising in commercial interior construction have taken on the interior project. The work is scheduled to be completed by the end of October. The first phase of Naas Racecourse’s redevelopment works was completed last January, with the opening of the €1.7 million The Circle building. 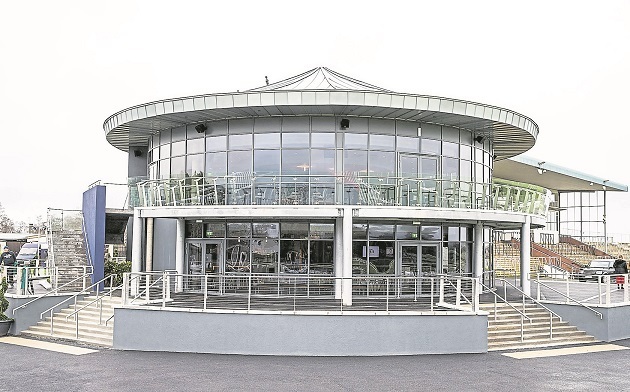 The striking cylindrical build, designed by Turnburry Design Consultants in London, is open to all racegoers and houses the Goffs owners and trainers lounge. Tom Ryan, general manager of Naas Racecourse said: “We continue to improve our facilities and aim to give racegoers the best experience possible.